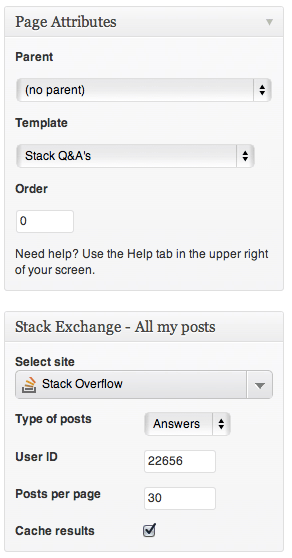 WordPress plugin inspired by the Meta question How can I download my content from a beta site?. Intended as a mean to export all of a person's participation in a Stack site. When viewing the page, one can print or export as HTML/PDF using the browser and system capabilities. The maximum number of posts per page is 100 and that's a SE API limitation. If the user's Answers are being viewed, the plugin will show 100 Questions per page with the user's Answer bellow it. 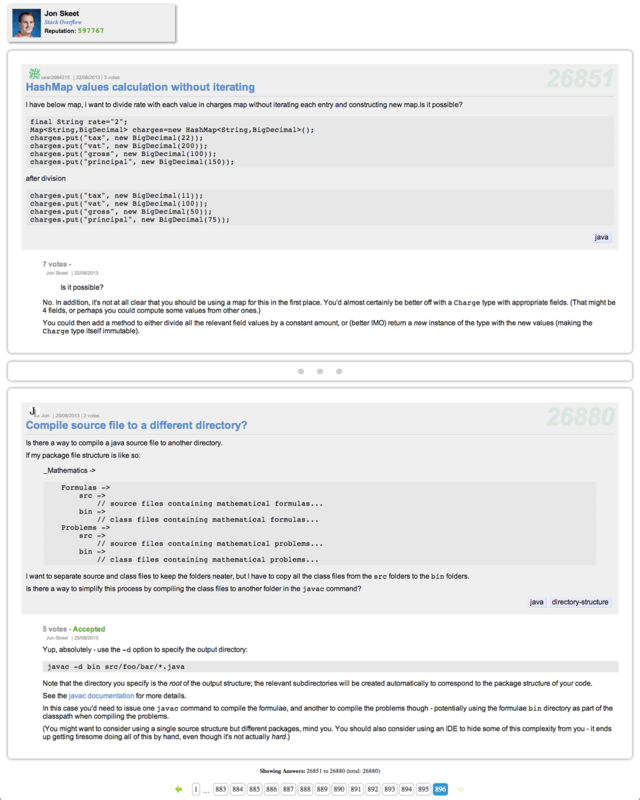 If the user's Questions are being viewed, the plugin will show 100 Questions per page with all the Answers given. The plugin will copy a page template file in your active theme's directory. When this template is selected you'll be presented with a meta box to configure the content to be displayed. WordPress plugin. Requires WP 3.3+. Tested in single and multisite environments. Please, use WordPress forums for technical feedback and bug reports. After hanging around at WordPress Answers, one learns a lot in plugin development. Special thanks to the austro-german wing, kaiser and toscho. And, surely enough, Stack Overflow for all the PHP/CSS/jQuery needs a programmer may have. Copy plugin template to theme folder: Page Template Example, by Tom McFarlin. Pagination scripts: Zebra Pagination, by Stefan Gabos. Dropdown with icons: Image dropdown, by Marghoob Suleman. - Plugin launched at WordPress Repository. Version number reset. Browse other questions tagged app wordpress . Is there a WordPress plug-in that is currently maintained?